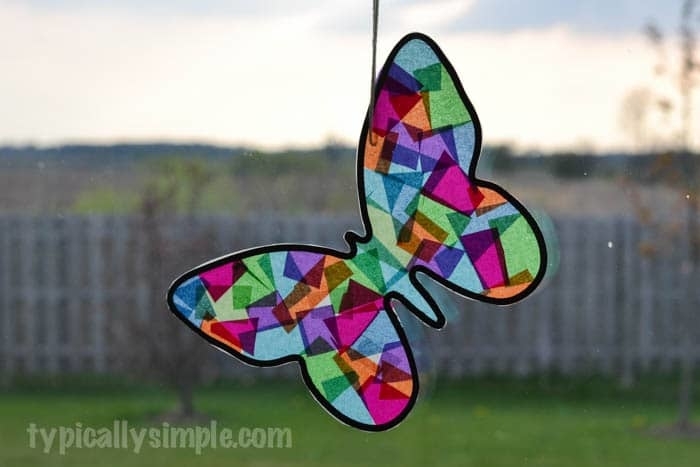 This stained glass butterfly is simple to make and adds some color to your windows! A fun and colorful craft to welcome spring! When I was teaching second grade, I loved making art projects with the kids for each season. 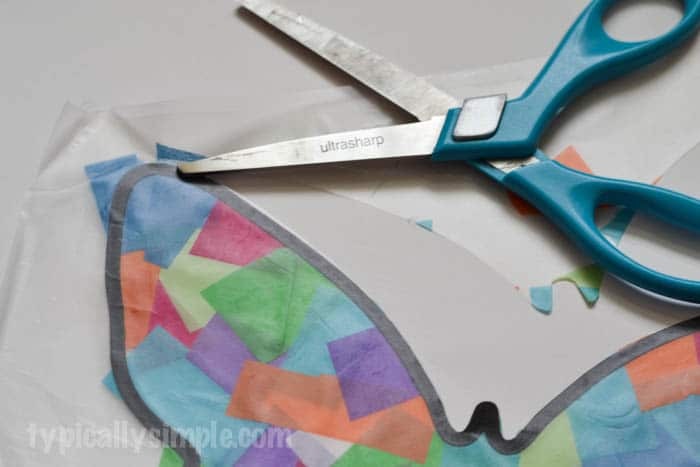 Since tissue paper is pretty cheap and can be used for so many types of arts & crafts, I tried to think of projects that they would love and we could use tissue paper. These stained glass projects were always a huge hit! And it helps building tracing, cutting, and pattern skills. Plus you only need a few basic supplies to get started. 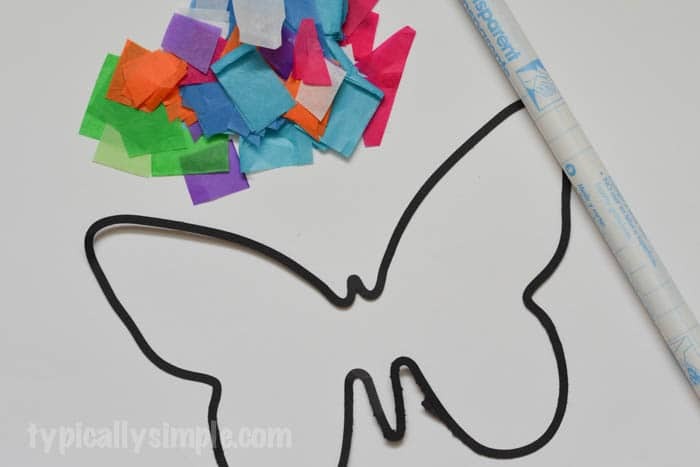 Trace the butterfly template onto a piece of black construction paper and cut it out. I just did a quick Google search to find a butterfly shape that I could use as a template. Fold the butterfly shape in half and cut about half an inch to an inch from the outside following the outline of the shape. This will create the stained glass frame. Cut a piece of contact paper slightly larger than the butterfly. Peel the backing off and stick the stained glass frame to the sticky side. 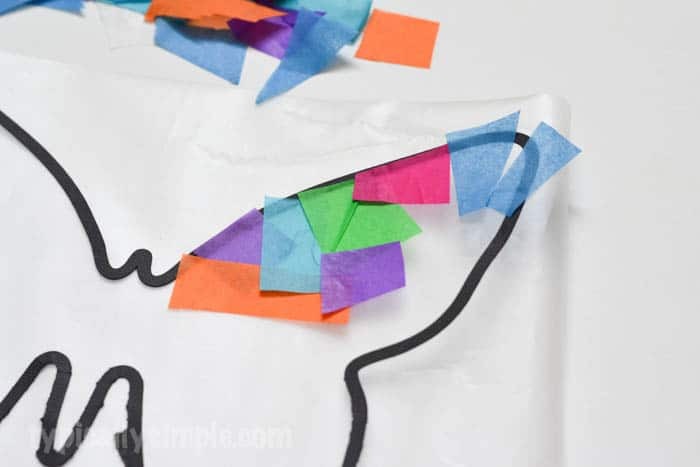 Cut a variety of colors of tissue paper into small squares and place on the contact paper, overlapping a little to cover completely. Take a second piece of contact paper, peel off the backing, and place it sticky side down on top of the butterfly. Trim the excess contact paper off around it. Finally, snip a little hole into one of the butterfly wings, string the yarn through and tie in a knot. And that’s it! Now your stained glass butterfly is ready to hang in the window. I love how easy this craft is to customize to different seasons or holidays. With spring in full swing around here, I thought a butterfly would be the perfect shape to use when making this stained glass project. This project was first published on By Trish Sutton.